Some people think they’re the same, so Mark Schaefer asks: What’s the difference between influencer marketing and word of mouth marketing? for his blog. Struggling with influencer marketing? Don’t feel bad. Even social networks are struggling with influencer marketing as Gil Eyal writes for Mobile Marketer. It’s not quite a crisis situation, but here’s How to handle negative comments about your business on social media from Toby Cox for the Institute for PR’s blog. Personalization vs. privacy: The struggle is real for CMOs. 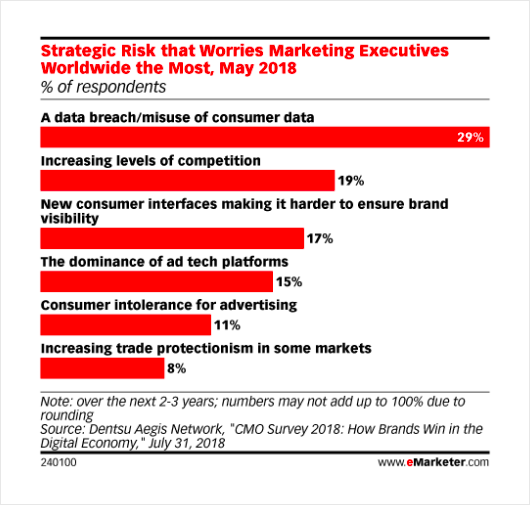 Ross Benes breaks it down in Protecting Customer Data Is a Top Challenge for CMOs for eMarketer. Andrea Manteca shares 5 tips to optimize your Instagram account for Edelman. Finally, here’s a interesting question as asked by Robin Kurzer for Marketing Land: As Facebook prioritizes Stories over Newsfeed, will advertisers follow suit? Thanks for reading! We’re taking a break next week for the Thanksgiving holiday here in the U.S., but we’ll be back after that.